The children explore ways to connect with their own hearts and with the hearts of others — not as an idea or concept, but as a part of us — a living, pulsing part of our bodies, ourselves. The children explore how moving at different speeds, intensities, and durations affects their heart rate. They discover which pace they like the best (at this moment in class) and then share this with each other. “How does someone else’s pace affect you? And how does your pace affect others?” They dance to the beat of their hearts and share their dancing with others. Can you feel the pulse of someone else? Of the group? The children move around the room, moving like the qualities of their heart. 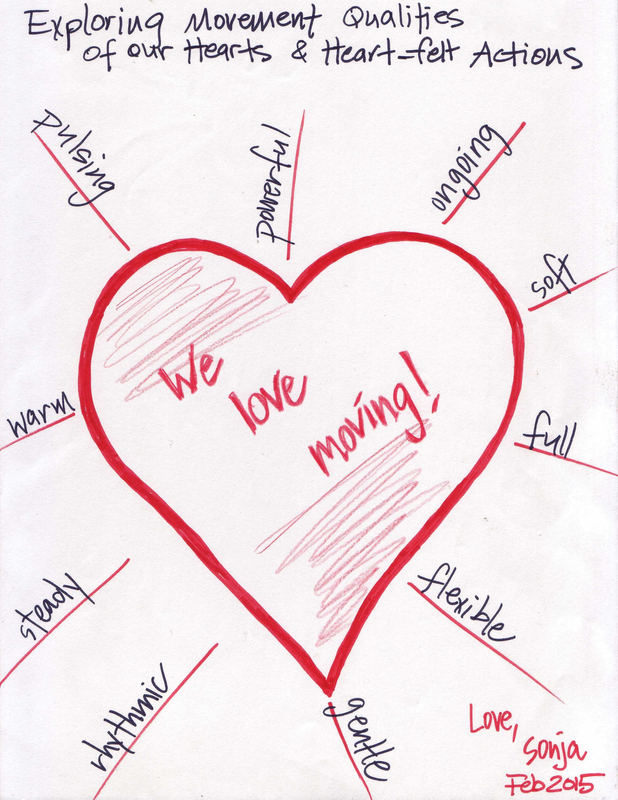 Some words your children used to describe their heart-felt movements: soft, curvy (compared to hard, rigid bones), flowing, strong, gentle, pulsing, twisting and untwisting, ongoing, steady, warm. The children put their hands on their ribcage and discover how the ribs surround and protect their heart. The ribs are hard bones with small muscles between each rib (as well as more supporting muscles) so we can move our ribcage — expand and contract, bend forward, backward and side to side, twist and turn — while still protecting our heart (and lungs, etc). “What happens when you tighten in your chest where your heart lives? Do you feel more restricted or protected? If you tighten even more in your chest, hands and face, how do you feel? Determined? Confident? Angry? Powerful? Scared? Excited? And if you tighten less? What is that like?” The children explore how changing the intensity of how they shape themselves affects how they move, how they feel and how they relate to others. Creating Heart-felt Actions: Lending a helping hand, warmly extending, generously offering, graciously accepting.